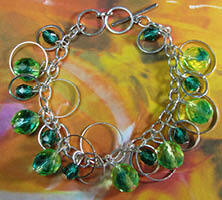 In my jewelry design studio I don’t wait for inspiration to strike before I sit down with all my beads and buttons. Creating is my obsession, so once I get started the ideas don’t stop. I have all my fun charms, long strands of chain, shiny beads and colourful buttons I want to use laid out infront of me and I let my imagination go. Combining beads and buttons to make a bracelet or a pair of earrings is easy when I keep it light and fun, I can go for hours, or days without running out of ideas. My inspiration in jewelry design comes from colourful beads, unique button shapes, and the interesting pattern combinations that I can make with all these things combined. Design options start popping into my head even when I am out shopping for my beads, buttons and charms, so sometimes I will make quick sketches of new earring, bracelet, or necklace styles on the spot. I go for bright bold colours and get inspiration from feminine shapes like heart shaped beads, butterflies charms and ladybug buttons. I enjoy trying new things in jewelry design to develop my creativity. That’s how these Drop Dead Fashion Earrings shown above came about. I made the first pair for my sister's birthday, so I had to think about what she would like. In the end I really wanted to keep them, but fortunately for her I made more. I like the combination of circle and square shaped buttons hanging on triangle links from big round beads. This Sweetheart Bracelet shown on the right is so simple and yet so striking. I love the hanging beads encircled with silver rings, because when you’re on the go the beads and rings move with you and make fun clinking sounds when they connect. You can see with this design that I love to create with round shapes and this bracelet is all about big and small round beads and silver rings.